We were talking with an Industry Marketing Committee today who are in the beginning stages of selecting a new platform for their online presence. The discussion included talking about some of the advantages of using an open source platform versus a closed CMS systems. It may surprise you to know that if you have used the internet in the last 10 years you have actually used Open Source software without even knowing it. Apache webserver, http://httpd.apache.org/, is a great example. Apache is the system that runs websites on servers. Simply put it’s what directs you to the proper place to see the website you were looking for and controls how and what you see on your system. 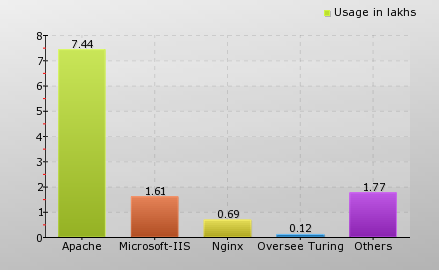 Apache dominates market share by an almost 7:1 ratio to the next most used version. So we know it’s the most popular, but why? Cost: $0 Licensing costs means anyone can get it anytime for free. Performance: Apache is one of the fastest webservers available. Cross Platform: Apache runs on every operating system generally used. Uptime: Our primary apache server has 587 Days of uptime since its last re-start. (That was the day the server was brought online out of the box). We use Apache mod-cache to improve performance of WordPress Sites (It makes Databases and Applications a bit smarter in how they utilize resources). Apache is certainly an example of a very popular and successful open source project. Another thats worth mentioning is the very software I am writing this article in. WordPress http://wordpress.org/, is a software set built in php and mysql (two other open source projects!). Its quite easy to deploy and use, but more importantly, anyone can go in and modify/add/change/use a whole host of plugins, themes, or systems to enhance or meet their needs. Ok that’s pretty cool, but even better is the site’s calendar function. Boyertown has a lot of events, and Building a Better Boyertown wanted to highlight all the great things going in. Event calendars may seem like a small thing, but the one they use is feature rich, with color categories, dynamic jquery effects, the ability to slice and dice displays, and highlight specific categories. From a cost standpoint it was a no-brainer for Boyertown. We were able to deploy the entire site, with calendar and donation functions for about the same a closed source shop would have charged for just the donation portion. But the real advantage is found in features. Well done open source software is feature rich, supported, stable, and highly customizable. Ultimately it just works for our clients and that’s why we are proud to be an open source development shop.